Livia is a second generation home grown Blue Buckaroo girl. She is absolutely stunning and a quiet, low energy girl who is a total cuddle bug - 17" and 35lbs. Colt is such a sweet boy. His pedigree is impressive, and he has the brains and keenness to match. Colt is backed by generations of therapy and service dogs. He is 15.5" and 28 lbs. Reserved - Thank you Kaitlin! Beautiful black tri female. Front white feet. Minimal white. Approx 25-30 lbs at maturity. Two blue eyes. 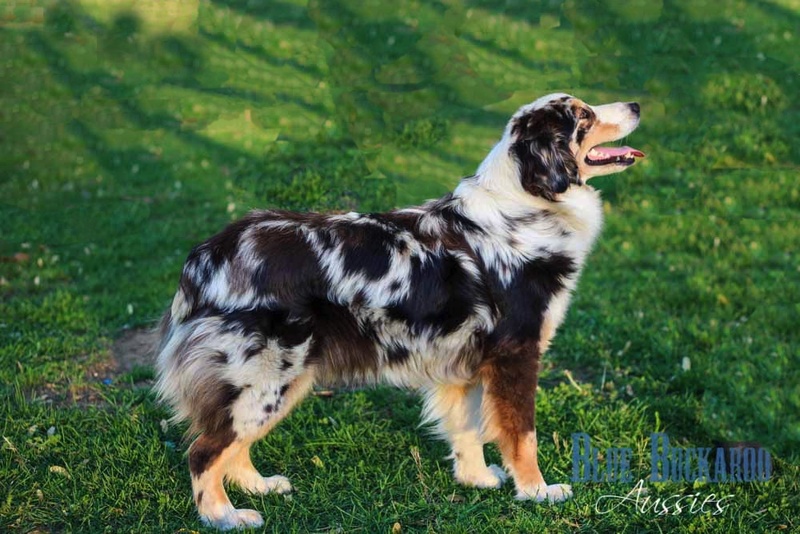 Beautiful bold blue merle girl. Brilliant coloring. Approx 25-30lbs at maturity. Blue eyes. Reserved - Thank you Mack! Stunning little blue merle female - you could not ask for a more beautifully marked up girl. Absolutely gorgeous and perfect in every way. Bright copper trim. Will be a show stopper! Approx 25-30lbs at maturity. Blue eyes. Striking Blue Merle male. Full collar. Absolute PERFECTION! Gorgeous, gorgeous boy. Nice copper trim. Approx 30lbs at maturity. Blue Eyes. Reserved - Thank you David! Striking Dilute Blue Merle male. Rare coloring - although not breed standard, gorgeous nevertheless - Full collar. Absolute PERFECTION! Gorgeous, gorgeous boy. Nice copper trim. Approx 30lbs at maturity. Blue eyes.